We trawled through our collection and came up with a few more of the famous Coca Cola radio spots from the cool and swingin' '60s. 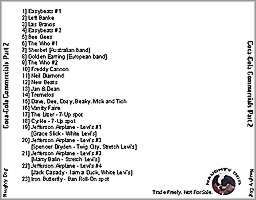 Plus some ultra rare radio spots, for instance the Jefferson Airplane doing four different spots for Levi's stretch and white jeans and the ultra heavy Iron Butterfly doing a deodorant commercial. If you've listened to Volume 1, you'll know each band or artist didn't just regurgitate the Coke theme but added their own vision to make each radio song unique from each other. There isn't a single jingle that's repeated. It wasn't boring at all to be inundated every day with a Coke jingle. We include a couple of bonus jingles for 7-Up and Levis to show how the rest of the brands tried unsuccessfully to emulate Coca Cola. Back in the day, Coke was in touch. The sheer range of bands who sang their song "Things Go Better With Coca Cola" demonstrated both optimism for the future and a unity of purpose we can only dream of today. Enjoy. 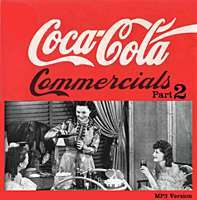 The Coca Cola Commercials Pt 1 is still available for download here.